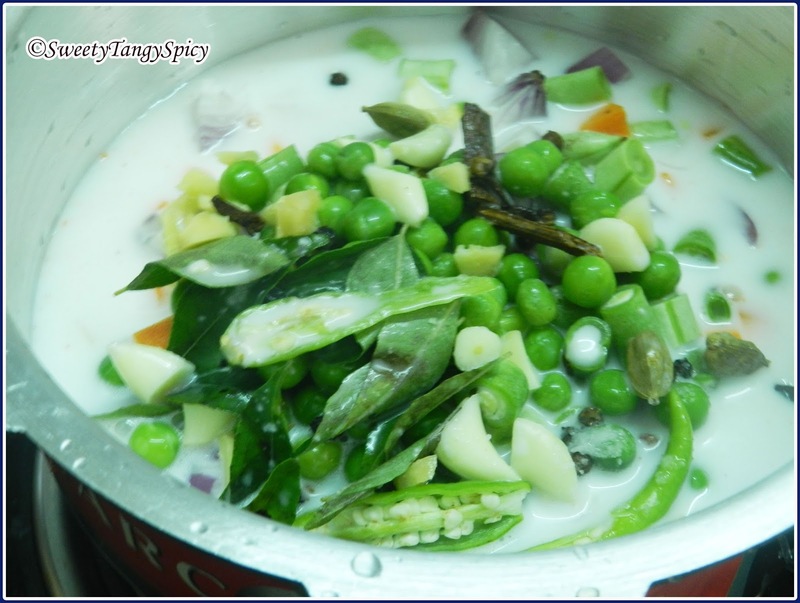 Vegetable stew or "istu" is a typical Kerala style mildly spicy recipe which usually served with appam, idiappam,chapati etc. 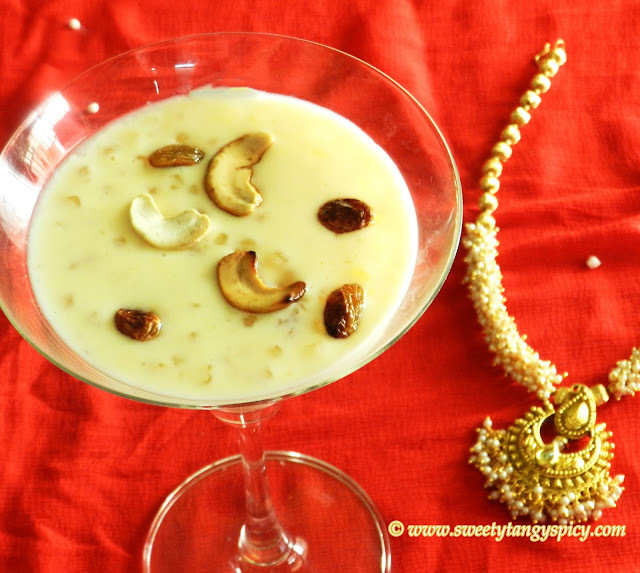 You can also try it with puttu. Ideal combination of stew is with appam. The aromatic flavor of whole spices and thick, creamy texture of coconut milk make it delicious. 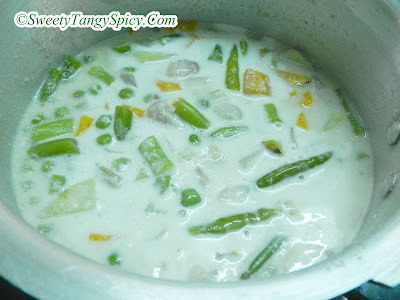 It is a very simple dish, very easy to make. Sometimes the vegetables are sauteed in coconut oil or ghee before cooking. But I usually prefer the following method. Pressure cook all chopped veggies with onion, ginger, garlic, green chilly,and whole spices in thin coconut milk. One whistle will be enough. Open the lid when all pressure releases. Mash vegetables with the back of the spoon and cook again on medium low flame until it reduce to half. 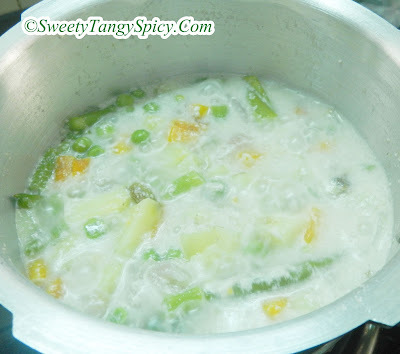 Add thick coconut milk, give a nice stir and immediately switch off the stove when it start to boil. (do not boil it.). 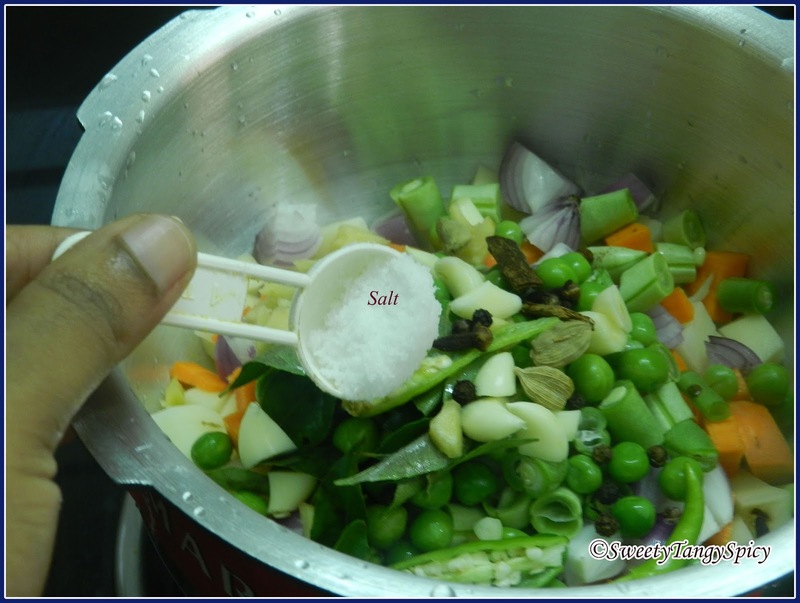 Season with coconut oil and quarter teaspoon garam masala, mix well and keep covered for a few minutes. 1. 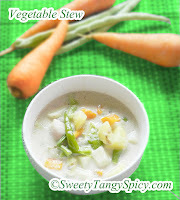 In a pressure cooker, take all the chopped veggies with onion, ginger, garlic, green chilly,and whole spices. 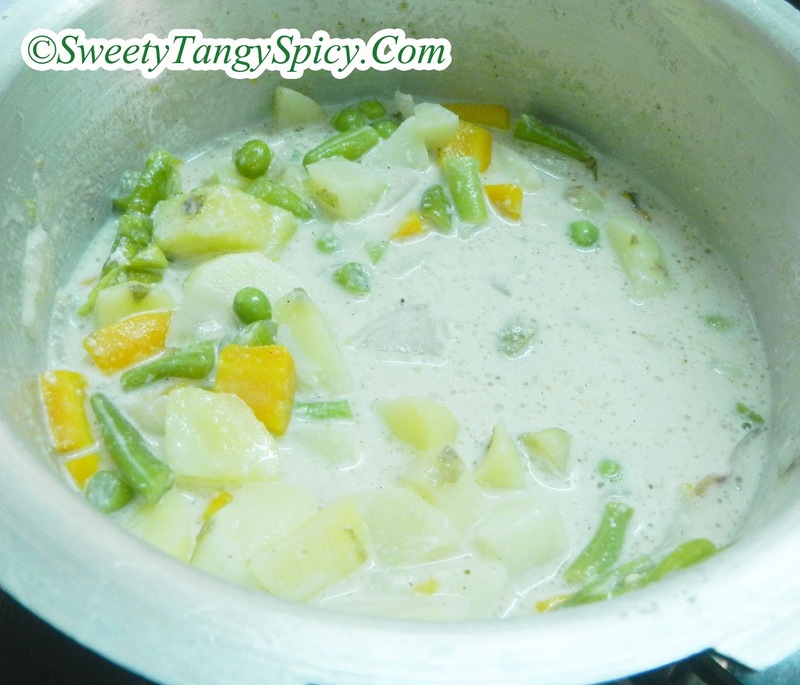 Add one cup of thin coconut milk and pressure cook it on high flame for one whistle. Open the lid when the pressure releases. 3. Mash vegetables with the back of the spoon and cook again on medium low flame until it reduce to half. 4. 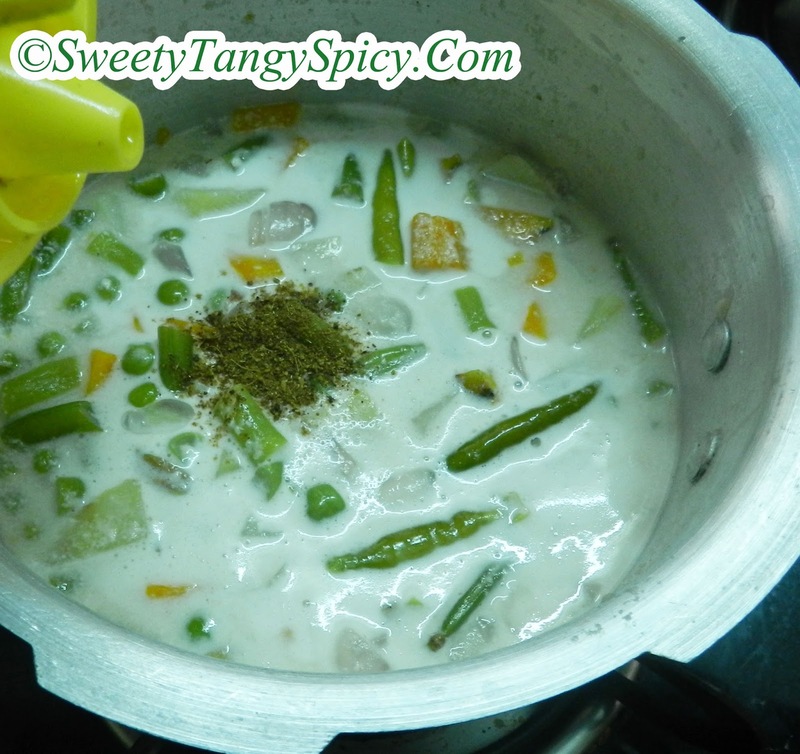 Add thick coconut milk, give a nice stir and immediately switch off the stove while it start to boil. (do not boil). 5. Season with coconut oil and 1/4 teaspoon garam masala, Mix well and keep covered for a few minutes. 6. Vegetable stew is ready. Serve with appam, idiyappam and chapati. You can also add cauliflower, cashews and raisins. 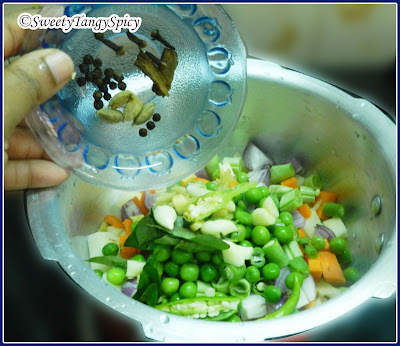 You can cook vegetables in pan method also. In that case use one and half cup of coconut milk.